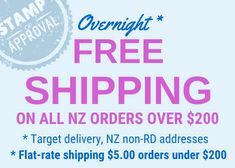 Order online (either pay by internet banking, or with credit or debit card - Mastercard, Visa and all debit cards supported by the NZ banking system through the shopping cart process, including a correctly activated Prezzy Card, OR contact us to arrange Paypal instructions (please quote your order number when doing so). Cut-off is 2pm Monday to Friday if you'd like your order to go the same day. Payments and orders received after that will be processed and sent the next day. We're open 9am to 3pm Monday to Friday excluding any of our closed dates. Have a quick look at our closed dates to see if any of these affect you at the moment.